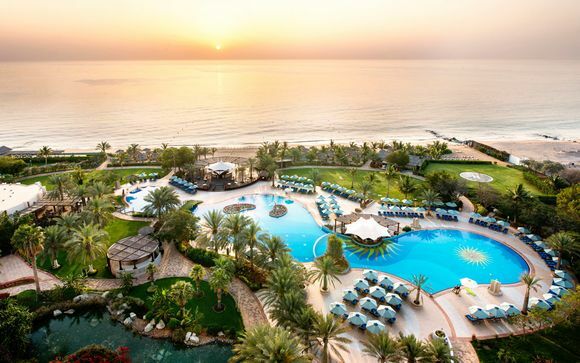 Impeccable indulgence: All Inclusive holidays to Dubai up to -70% off To take advantage of these offers, join now for free! Experience the very best of one of the most exciting and exclusive destinations across the globe with exceptional discounts and added extras at luxury hotels in Dubai. Comprising of only 4 and 5-star hotels, these unbeatable offers were hand-crafted with you and your needs in mind. So, whether you're after some family fun in the sun, a completely indulgent spa holiday or a sumptuous food-fest, we do have something perfect for you. Do you want to taste the traditions of Dubai with mouth-watering fresh fish dishes? Or how about a crisp, cool cocktail enjoyed in the heat of the Arabian sun? Whatever it is you dream of, all inclusive hotels in Dubai can create it for you. Redefining All Inclusive, some of the most popular and iconic hotels have developed a unique Dine Around concept turning All Inclusive hotels in Dubai into a byword for extravagance as well as being great value for you. With a huge choice of over 50 cuisines and award-winning restaurants at your fingertips, your stay can be as glamorous or laid-back as you should choose. Waterparks, kid's clubs and much, much more! Whatever the activity, Dubai's hotels have it for you. Often included in their All Inclusive packages; days at thrilling waterparks, excursions through fascinating aquariums and award-winning kids clubs, complete with fully qualified staff, are part and parcel of what a stay at a luxurious Dubai property has to offer you. So keep the family happy while you retreat into spa luxury and experience the best of Arabia's ancient therapies. Designed to completely rejuvenate your mind, body and soul, added extras like these are what make these hotels so desirable and your holiday so memorable. With such unforgettable experiences, these hotels unsurprisingly book up during the most popular months; between October and April. We do still have availability and fantastic prices in those months for some of our favourite all inclusive hotels in Dubai, but this won't last long. To keep up with the best prices and biggest flash sales we have to offer, sign up to become a member and receive exclusive emails and offers. We know that our prices and products are completely irresistible and that we can find one which is perfect for you, every time.